On June 27, the Next Gen Committee welcomed Brett Heyman, founder of accessories brand Edie Parker and a 2016 Rising Star Award winner, to FGI’s New York City headquarters. Over the course of the evening, Heyman talked about everything from her inspiration for her collections to how personalization is driving her business. She also joked that her Rising Star Award is the first and only thing she’s ever won. Heyman was always obsessed with fashion but she had “pragmatic parents,” so she didn’t immediately pursue a career as a designer. Instead she did internships at Elle magazine and Armani, which helped her land a job doing public relations at Gucci after college. She later moved on to Dolce & Gabbana before returning to Gucci. She says her career in public relations gave her a “great awareness of the industry” and she saw an opportunity in the evening bag category. She was also able to leverage relationships she built throughout her career to secure editorial and red carpet placements for her axis deer tote, which helped establish her brand. Heyman grew up in Los Angeles and loved buying vintage acrylic bags and always received compliments when she wore them. When she finally decided to leave her corporate job to start her own label, her beloved vintage bags were her inspiration. Even though it was risky to leave a corporate job to start her own brand, Heyman says she launched Edie Parker when she was a “grown up” and she didn’t rush anything. “I had a good job for a while. If I try and fail, I can get another PR job. I had done my research,” she said. She said growing slowly has allowed her to be profitable since inception because she didn’t have the pressure of private equity investors. Her business really took off in 2011 when she made a bag with her friend’s name on it as a 40th birthday gift. “It felt new. Personalization is everywhere now,” said Heyman. When she offered the personalized bag concept to her buyer at Bergdorf Goodman as an exclusive, it wasn’t warmly received. Heyman recalls the buyer telling her, “I think that’s so weird.” The Edie Parker “Bespoke” program ended up taking off, partially thanks to the support of celebrities and influencers. The Edie Parker website now features an interactive simulator to help customers design their personalized evening bags. The clutches are “truly handmade” for each customer and take about six weeks to produce. Heyman says she now faces the challenge of expanding her business to avoid being a “one-hit wonder.” When exploring new categories, Heyman said she asks herself, “Edie Parker is for Friday and Saturday, how do we get the other days of the week?” Last year, Edie Parker expanded into the home category in an effort to move beyond the weekend and the evening bag category. Heyman says it makes sense for the brand because the home line uses Edie Parker’s core material of acrylic. Another new endeavor for Edie Parker is its recently opened Madison Avenue flagship boutique. 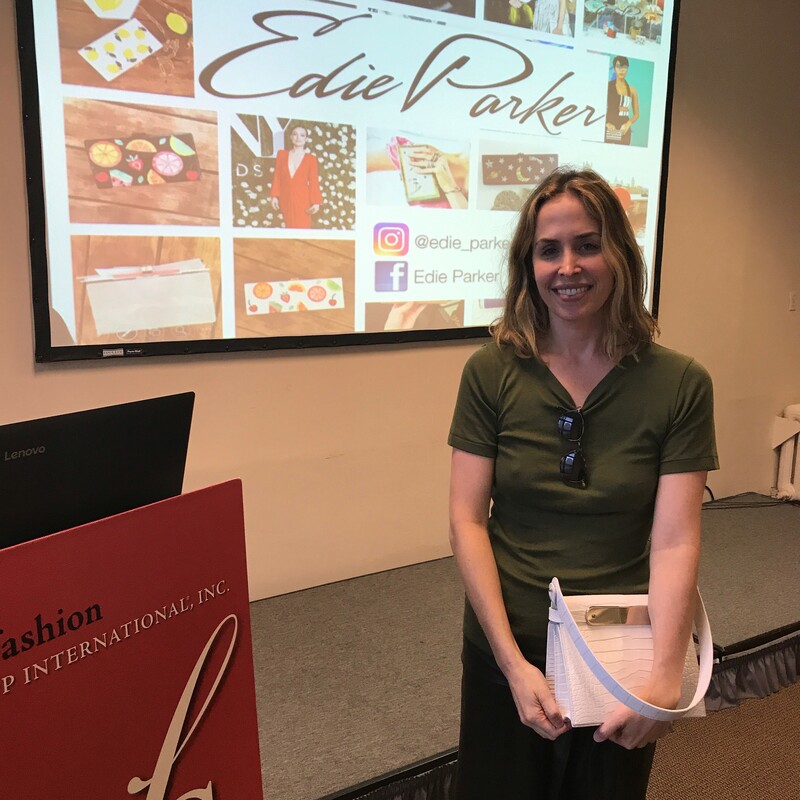 Even though it’s a “tricky time in retail” and Edie Parker has great wholesale partners, Heyman said she “needed a place where people could see the world of Edie Parker.” Heyman said the store is part of her plan to build her brand. Her philosophy is to “focus on what you’re good at and add slowly.” Heyman also touched on her philosophy for a healthy work-life balance. Contributing writer of Fashion Group International’s weekly iTalk and long time member of the Publications Committee. This entry was posted in FGISpeaks on September 21, 2017 by admin.